In “Ready for Harvest III,” I set up my easel at the agriturismo we were staying at in Tuscany to capture this gorgeous view of the rolling hills and the grapevines planted on their property. 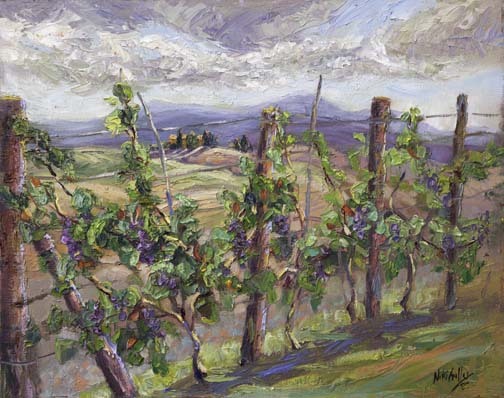 The grapes were so plump and juicy, it looked like they could be harvested any day. I liked how the plantings framed the view in the distance, creating a sort of window pane in the foreground, with just a sliver of the farmhouse in the mid-ground. With some clouds rolling in, the sun created that unusual glow that I’ve only seen in Italy with gorgeous purple shadows and gold and pinks hitting the hillsides, giving them form. I hope you, too, are transported to this peaceful place surrounded by beauty, warmth and delicious home-grown food and wine.